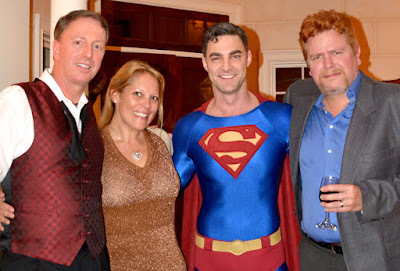 I recently hosted the very first wanderlust ATLANTA party, a "Thank you!" for some many of those who have enthusiastically supported and encouraged me as a tourism blogger over the last five years (I wish I could have invited ALL of them! ), and was joined by a few fellow wanderlusters, too. This was the most fun party I've ever hosted (and I've hosted many) and I believe my super guests quite enjoyed the surprise guest...Superman himself! The party was cocktail attire. I totally wanted to don my hand-tied bow tie (which I learned how to tie when I lived in Washington, DC when I was attending black tie event after black tie event—so much fun! )...so I did. But, I had to make the excuse that it'd been so long since I'd worn it that I'd forgotten how to tie it...and then just ran out of time to Google how to tie it before the party started. I kinda like the James Bond untied after-party look, don't you? 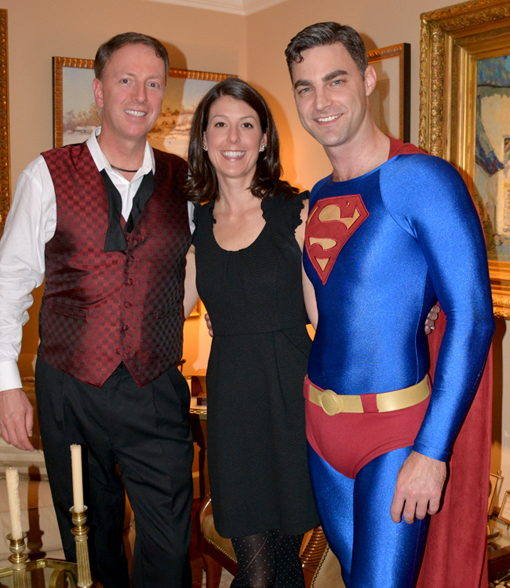 I'll share you with you momentarily who the gorgeous brunette is in the photo above...Superman is her husband! 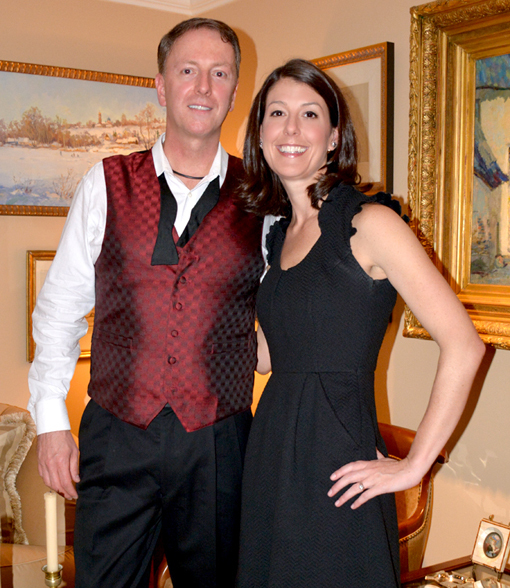 Speaking of gorgeous, Summer Loftin, of Summer Loftin Antiques, was at the party! She's the one who introduced me to Howard Finster's Paradise Garden in Summerville, Georgia, where she's on the Board of Directors of its Foundation. I first met Summer, through our mutual friend Perry, who was also at the party, at the 2012's The Cathedral Antiques Show's Inspirational Showhouse. Summer's 2013 showroom was magnificent! I love that my friends who co-founded Atlanta Movie Tours were in attendance. Their being there made me my day! I've loved writing about the Atlanta Movie Tours (search "Atlanta Movie Tours" on my blog and you'll see what I mean) I've wanderlusted...four of the five they offer and two of those twice! Patti and Carrie, and their husbands, are so incredibly awesome! Patti is now with Sandy Springs Hospitality & Tourism—I hope they soon realize what a treasure they have in Patti...actually, I know they will. I continue to run into Carrie at places like Dragon Con, Walker Stalker Con and the Fox Theatre where she was recently a panelist at an ACVB program. I love you, ladies! Sally was also there. Sally is "Margaret Mitchell" in Atlanta Movie Tour's "Margaret Mitchell's Gone With the Wind Tour". I'm such a Sally fan, but she's totally modest. Looking at the movie tour reviews and other articles about Sally, modesty aside, she's a pretty awesome human being! I'd met Katie (pictured above) when she worked with Museum of Design Atlanta, which I joined upon discovering them when they were still located in Downtown Atlanta. I have many fond MODA memories, particularly one MODA Field Trip where I, Barry, Katie and David (Superman) and architect Luc were in attendance, before some of us knew each other. Small world. Two of my other favorite wanderlust people came to the party...Hillary and Martha of the Atlanta History Center! They've been so wonderful to me and to wanderlust ATLANTA, so it meant the world to me that they were there. Be sure to check out all the upcoming events at the Center, especially Candlelight Nights, which I've attended and so very much enjoyed! This year's nights are December 11 and December 18, both Friday evenings...I plan to attend on the 18th. Prior to the party I tried to build the suspense of who the surprise guest was going to be. 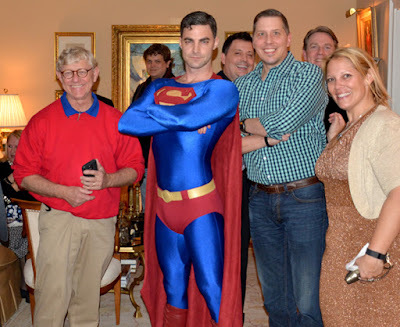 I like to think that my guests totally enjoyed their photo-ops with Superman and know that after the fact none were at all surprised that I managed to tie the surprise guest to my love of Dragon Con cosplay. In the photo above, that's Terry on the left, of Architecture Tourist, one of the most enthusiastic bloggers I know and an early supporter of wanderlust ATLANTA. He gave me an interview for my blog before he was featured on the side of a building. I aspire to be so prominent! Also in the photo above, right of Terry is Daniel from Center for Puppetry Arts, Superman (who I introduced you to at this year's Dragon Con), Perry—fellow wanderluster and friend of 20 years, Mike—fellow wanderluster and friend of nearly 20 years, Barry—fellow wanderluster and Wanderluster Extraordinaire, and Carrie from Atlanta Movie Tours. And that's Patti again peeking through on the very far left. Beth, fellow blogger and author of The City Dweller, also attended and so thoughtfully bought me a tin of candies with Yoda on it! Yoda and R2-D2 are my favorites from the Star Wars films. How sweet of Beth to think of me on a visit to NYC when she saw Yoda. And I love her blog's tagline: "Curiosity is my compass!" I'm a very fortunate person to be able to call so many from the tourism industry personal friends. There are those who you meet and exchange cordial small talk, but then there are those who you meet who you get to know and look forward to seeing. I'm so lucky, and grateful, that so many who I encounter on my wanderlusting adventures I get to know and call friend. 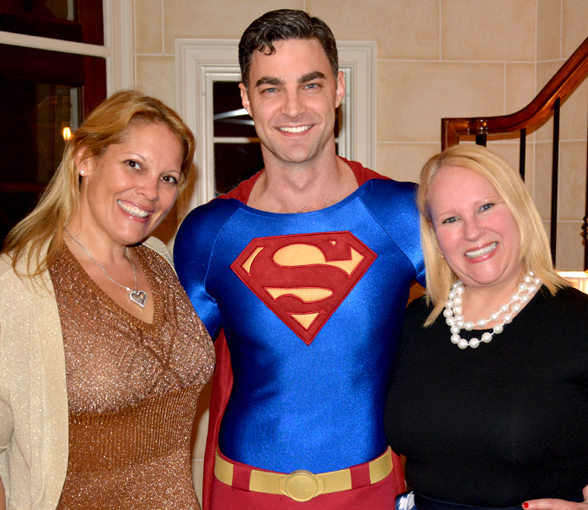 I was so pleased to get a photo with Carrie, and her husband Steven, with Superman. What an awesome shot! Be sure to read my Walker Stalker Con post for a humorous story about how I thought Steven was Abraham from The Walking Dead! And be sure to check out Atlanta Movie Tours' Big Zombie Tour 1 and Big Zombie Tour 2, as well as the rest of their tours! I was so busy hosting and enjoying my guests' company that I never really got into photographer mode, but sharing time with and thanking my fans was priority number one! And now I have to thank them again for making the party such a wonderful time! Thank you, thank you! I'll see you all and many more throughout the next year of wanderlusting Atlanta! The food was always great, I think they just updated their menu and it's off the hook. Who would expect delicious pizza at such big venues in atlanta. Not me, but you can get some of the best pizza there. The best place in this area.